Confidently perform susceptibility testing using one of the latest antimicrobials with the Thermo Scientific™ Sensititre™ Delafloxacin DELAXN AST Plate. 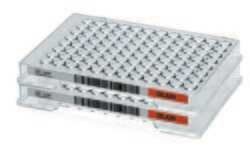 Address your formulary needs with this micro-broth dilution plate for antimicrobial susceptibility testing that meets CLSI standards. Obtain true minimum inhibitory concentration (MIC) results to both inform targeted therapy decisions for resistant infections with otherwise limited or no treatment options, and to support antimicrobial stewardship to preserve effectiveness. Expand treatment options for acute bacterial skin and skin structure infections (ABSSSI) by using the Sensititre Delafloxacin DELAXN AST Plate for accurate, economical delafloxacin susceptibility results. The Sensititre System is a leader in AST solutions, offering flexible, customizable testing options for laboratories of all sizes.